What seasonal chore makes everyone, rich or poor, young or old, groan with disappointment? Gutter cleaning. As if standing 5 metres off the ground wasn’t bad enough, someone also has to shove their hand into a rotting pile of leaves, muck and soggy nastiness. Fortunately, that someone doesn’t have to be you. By hiring a professional Perth gutter cleaning company, you can skip the hassle of performing one of the most annoying seasonal chores of home-ownership. 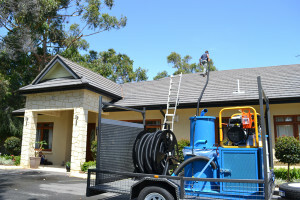 Unfortunately there are no approved gutter cleaning companies in Perth. We are always on the lookout for the best companies, so if you know one who goes the extra mile please contact us. Fast, free, over-the-phone quotes and advice give Pat Wilson’s Express Home Maintenance a charming sense of personal service missing from other, larger gutter cleaners. To go with personable service, Express Home Maintenance also has a full-list of certifications for their work and will show up on-site to clean gutters within one-week of issuing an initial price quote. Established since early 1994, Gutter Gobbler can claim the title for “The First Perth Gutter Cleaning Vacuum Specialist”. Family owned and operated, Gutter Gobbler will not only get gutters and downpipes cleared of debris, they’ll also provide consultation services for roof maintenance at no extra-cost. Call today or use their online booking tool to receive a free-quote. Specialising in servicing multi-storey structures, Gutter Clean Extreme has been sending their technicians up to the most hard-to-reach regions of the roof via a system of cherry pickers and roped harnesses for 15 years. Free quotes are happily provided for both residential and commercial clients, however regular maintenance scheduling is only available for those in the commercial space. Safe, reliable and professional service are the hallmarks of Fast Flow Gutter Cleaning and by all accounts they should be able to deliver considering their equipment, training certificates and liability insurance. Like several other providers, Fast Flow will provide a free quote via the phone or their website, but unlike many other providers, they’ll include a free roof examination and report with each hire. One more perk: Fast Flow backs every job with a 100% satisfaction guarantee. Gutter Heroes puts forth more than just a heroic effort every time they show up on the job—Effort will only carry a company so far. Punctual service, industry-leading equipment, flexible scheduling and—most importantly—delivery on the promise of complete client satisfaction are the measurable needed to take an organization to the next level of growth. With franchises servicing Perth Metro, Rockingham and Mandurah, Gutter Heroes has successfully made the leap from one-shop by delivering on the above. Free project assessment and final quote available over the phone, meaning Gutter Heroes won’t change their initial quote once they arrive on-site. The original price quoted will be the price paid. In-depth, Super Vacuum cleaning system. Gutter guard installation and repair. General roof inspection, maintenance and repair. Online testimonials from former customers. 24 to 48 hour turnaround for all projects from start to completion.